Helensburgh & Districts Lion's Grand Street Parade - Coalcliff SLSC Needs You! We have been asked to participate in this year’s Helensburgh Parade, with an appropriate theme of ‘Tomorrow’s Heroes Today’. It would be great if we could get as many patrolling members and nippers to march. Bill McWilliam is prepared to tow the jet ski as the trailer is now road registered, so I’m asking for everyone if they are able to participate to come along and support the club. Meet in your gear at Francis Street, Helensburgh at 4 PM with the March starting at 4:30 PM. Read more about Helensburgh & Districts Lion's Grand Street Parade - Coalcliff SLSC Needs You! Note - Membership Fees increased by $15 this year to cover compulsory pink rash shirt for all competitors and Water Activities - These will be given out to every person who registered after they arrive. Please Note - It is important for any person that is involved in the club in any capacity so that they are covered by insurance policy. Dr. Rip Presentation - Booking Essential. Read more about Dr. Rip Presentation - Booking Essential. Coalcliff SLSC - Registration Dates - 2013. Saturday at 10am-12 at Helensburgh on Saturday 31st August and Saturday 7th September or at Coalcliff SLS Club on Sunday 1st September and Sunday 8th September 2013. 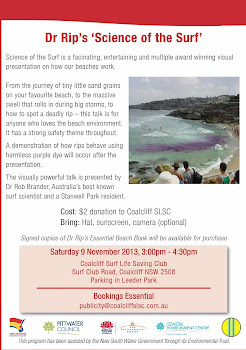 Read more about COALCLIFF SLSC - Registration Dates - 2013. Nippers Dates For 2013 / 2014 Season. Read more about NIPPERS Dates for 2013 / 2014 Season. 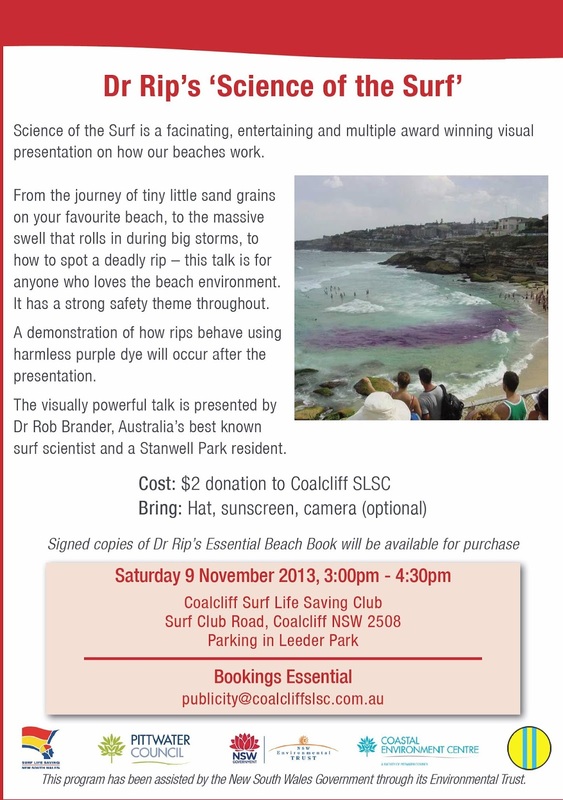 Booking details - E-mail 'publicity@coalcliffslsc.com.au' to Book - Gold Coin Donation to Attend. The fees for the 2013//14 season have been increased by $15 for each category of membership to cover the cost of a 'Pink Rash Shirt' that has been mandatory for every member that competes in any water event by Surf Life Saving Australia. Both Nippers and Seniors, with each member to receive their Rash Shirt before they are able to enter any competition. Last Tuesday Jenelle McWilliam received a phone call from the Education Officer of SLS NSW, advising that she had been selected as the NSW winner of the “Community Education Program of the Year”, stating they were very impressed with her submission. Jenelle's program will be the SLS NSW entrant in the SLS A awards, which will be presented sometime around the Aussies titles next year.